In the course of interviewing (and examining the trading records of) hundreds of wealthy traders over the past year, I discovered the best ones do similar things to find, enter, manage and exit trades for profit - things average or losing traders simply don't do. AUDIO: Download an mp3 of the audio by right-clicking here and choosing "Save link as". PDF: Download a PDF with all 20 Habits: Part 1 and Part 2. This first habit was consistent among every great trader I talked to - without exception. Most traders become very anxious with winning trades because they don’t want them to become losing trades. That’s a good thing – until their impatience forces them to exit their winning position too early and leave money in the market. On the other hand, how many times have you said to yourself, “I’m going to let this losing trade go just a little bit longer and see if it turns around.” You’ve just been patient with a losing trade and impatient with your winner. Wealthy traders flip this thought process around and do exactly the opposite. When they have a trade that is going well and is profitable, they remain patient to see how far it can really go. When they have a trade going against them, they immediately exit to limit the loss and begin looking for the next opportunity. If you’ve set a stop loss, never move it in the hope that your trade will turn around – it rarely will and will only increase your loss for the day. Start being patient with your winners and impatient with your losers - it is the first step toward joining the minority ranks of wealthy traders. 2. Wealthy traders realize that making money is more important than being right. It is human nature to want to be correct in our assumptions and predictions on the market. We all want to believe we are interpreting market data properly and have made the right choice to go long or short the market. But wealthy traders rarely have a bias on the market prior to the open or any time prior to entering a trade. Once they do make a trading decision, if the trade becomes a loss, indicating they were initially wrong, they will have no problem immediately making a trade in the other direction. I have interviewed successful traders who form a bias in the morning and will only trade in the direction of that bias for the day, but they are rare. Instead of trying to force their opinion on the markets, determined to prove themselves correct, wealthy traders will switch sides at a moment’s notice if the market tells them it is time to do so – even if they were “sure” the market was going to go the other way that day. Being right is not important – growing their trading account and net worth is. 3. Wealthy traders view technical analysis as a picture of where traders are lining up to buy and sell. Many traders view moving averages, Fibonacci and trendlines as exact places where price is expected to turn and move in the opposite direction. Successful traders don’t view technical analysis that way. Wealthy traders see charts as snapshots of where traders are lining up to buy or sell. Instead of seeing bars, lines and clouds, wealthy traders see price points where traders have placed orders to enter and exit the market, either as stop losses or entry points. The stock, option or futures contract has no idea where it will find support or resistance. It is the market participants who determine this and experienced traders know this and will place their own orders around those levels to take advantage of the 95% of traders who lose money trading. 4. Before they enter every trade they know where they will exit for either a profit or loss. We’ve all heard that we should be using stops whenever trading to avoid large losses. However, very few traders actually know where they will place a stop and a profit target before they enter every trade. Wealthy traders leave nothing to chance and plan every trade in its entirety before they even enter. Your written trading plan should have objective measures of where your stop loss should be placed as well as where you’ll take profits. 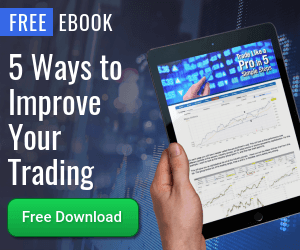 Not knowing, or simply guessing at where these price points will be after you have entered a trade can lead to indecision or price targets outside of the average range of the security you are trading. Why set an arbitrary profit target of three points when the average range of that market is only two points? Furthermore, wealthy traders set position sizes and stop losses that are almost always a function of their risk tolerance for any given trade. For example, if the maximum risk on any one trade is 2% of their trading account, the number of shares they will trade (based on the price of shares) and a reasonable stop loss is calculated before the trade is placed. I rarely talk with a wealthy trader who says their position size is 1,000 shares. They usually tell me it depends entirely on what they are trading. They take their maximum acceptable loss and work backward to find a stop loss and position size that matches that objective measure. 5. They approach trade number five with the same conviction as the previous four losing trades. We’ve all had that run of bad trades that shakes our confidence in the “edge” we think we have in the markets. Our setup appears again and instead of taking that fifth trade, we hesitate, not wanting to endure another losing trade. Of course, that fifth trade would happens to work beautifully and not only would have made up for the previous four losses but put us net-positive for the day. Unless the market has indicated something has changed and we truly believe our strategy is solid, there’s no reason to hesitate if the trade setup presents itself. Even automated system traders will tell you that a run of losing trades that goes beyond the normal drawdown in back tests is normal. The key, of course, is knowing when your “edge” is no longer an “edge” vs. a statistical run of trades that just haven’t worked out.